Lion Force brings Knight Rider to a comic shop near you! 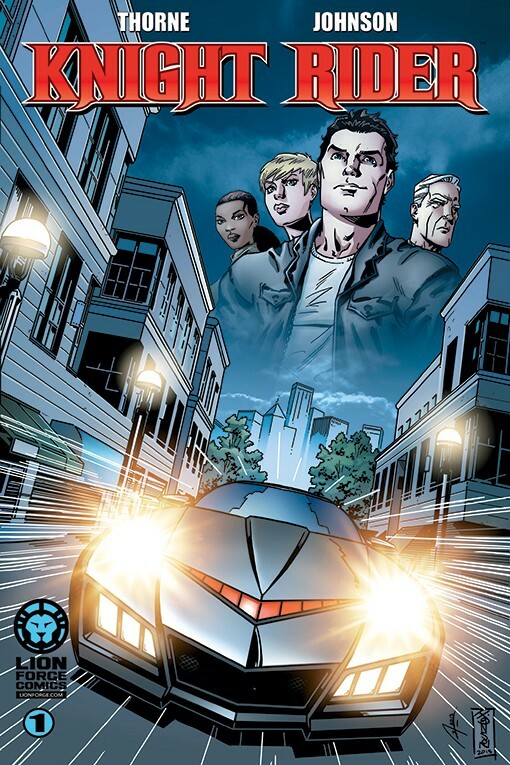 Over the last year, Lion Forge comics has released a digital comic based on Knight Rider. Written by television scribe Geoff Thorne (Law and Order, Ben 10) with explosive artwork from Jason Johnson (Generation X, The Flash, Wetworks), the graphic novel is a modern-day reboot but with all the important pieces intact. The trade paperback is labeled as Vol 1, which contains eight of the previously released series. Here is hoping there will be enough issues for a Vol 2! Michael Knight and KITT  everyones ultimate dream car  return to action in this high-octane thriller, updated with tomorrows tech to combat the threats of today. Secret agent Michael Knight just wants to take his girlfriend Katherine out for a night on the town. The bad news is that Katherine is also a brilliant scientist whom hes been assigned to protect, along with her top-secret Project: Rider  not a good combination for a romantic evening! When a team of mercenaries crashes their date, its up to Michael and the mysterious Bishop to keep Katherine safe and the project under wraps. What follows is a high-speed race through the streets and mountains of California in which loyalties are tested, alliances betrayed, and a global conspiracy is revealed. And, of course, at least one incredible talking car! All the turbo-charged thrill of the classic TV series is back in this high-tech spy-fi adventure! Available for $14.99 from your local comic shop or Amazon.com. Be sure to check back soon as we'll be announcing a giveaway for autographed copies!